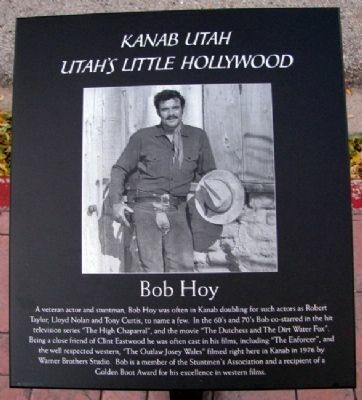 A veteran actor and stuntman, Bob Hoy was often in Kanab doubling for such actors as Robert Taylor, Lloyd Nolan and Tony Curtis, to name a few. In the 60's and 70's Bob co-starred in the hit television series "The High Chaparral", and the movie "The Dutchess and The Dirt Water Fox". Being a close friend of Clint Eastwood he was often cast in his films, including "The Enforcer", and the well respected western, "The Outlaw Josey Wales" filmed right here in Kanab in 1976 by Warner Brothers Studio. Bob is a member of the Stuntmen's Association and a recipient of a Golden Boot Award for his excellence in western films. Location. 37° 2.884′ N, 112° 31.726′ W. Marker is in Kanab, Utah, in Kane County. 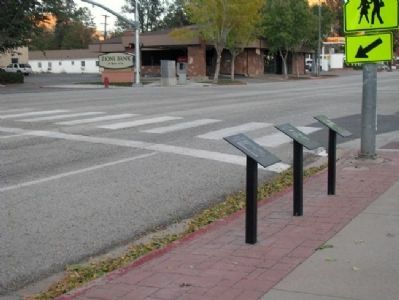 Marker is at the intersection of West Center Street (U.S. 89) and North 100 West, on the right when traveling west on West Center Street. Touch for map. Marker is located beside the sidewalk, adjacent to a fence, on the north side of the street. 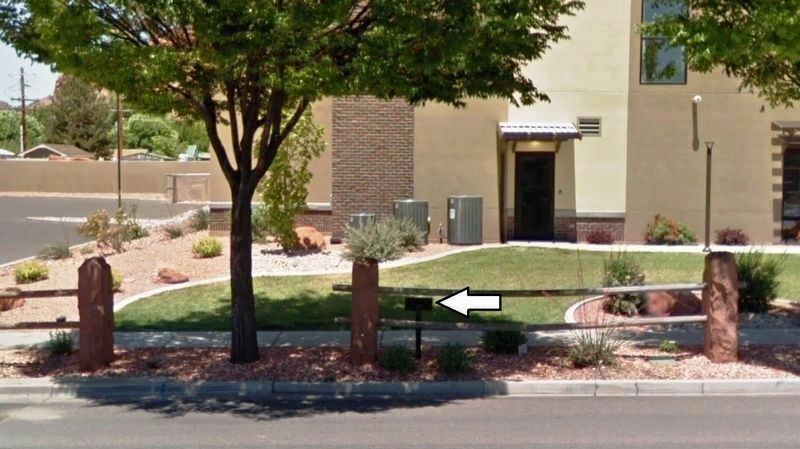 Marker is at or near this postal address: 150 West Center Street, Kanab UT 84741, United States of America. Touch for directions. 8 other markers are within walking distance of this marker. Ted Markland (here, next to this marker); Don Collier (here, next to this marker); Ken Curtis (here, next to this marker); Linda Darnell (here, next to this marker); Sidney Poitier (here, next to this marker); Daniel Boone (a few steps from this marker); Robert Taylor (a few steps from this marker); Peggie Castle (a few steps from this marker). Touch for a list and map of all markers in Kanab. More. Search the internet for Bob Hoy. Credits. This page was last revised on March 21, 2019. This page originally submitted on April 8, 2011, by William Fischer, Jr. of Scranton, Pennsylvania. This page has been viewed 639 times since then and 14 times this year. Last updated on March 9, 2019, by Cosmos Mariner of Cape Canaveral, Florida. Photos: 1, 2. submitted on April 8, 2011, by William Fischer, Jr. of Scranton, Pennsylvania. 3. submitted on March 9, 2019, by Cosmos Mariner of Cape Canaveral, Florida. • Bill Pfingsten was the editor who published this page.